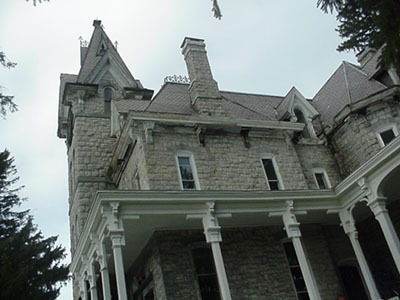 The stone castle in New York that you were looking for info about is called Skene Manor. 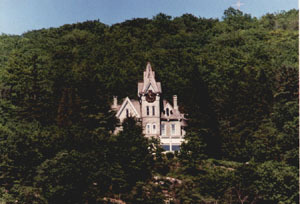 The manor is located at 8 Potter Terrace in Whitehall, a town in northern New York State. Skene Manor was being used as a restaurant, but I don't know if it is still open. The manor was built around 1874 by Colonel Skene. The manor is supposedly haunted by the colonel's wife. The story goes that when his wife died, the colonel was told that he would keep his home only if his wife's body remained above ground. He had his wife's body placed in a lead lined coffin and kept it in the basement. When the house became a restaurant the new owner placed the coffin behind the bar and built a stone fountain around it. Apparently the fountain is still there, and people have seen the spirit of a young woman in a Victorian gown in the manor. She wears an unusual ring on her right hand. Some have reported seeing a hand with a large ring on the middle finger materialize in the center of the fountain. I got this information from "America's Most Haunted Places", by Nancy Roberts, and "The National Directory of Haunted Places", by Dennis William Hauck. ABOUT SKENE MANOR : ACTUALLY, THEY SAY THAT SKEENE BURIED HIS WIFE UNDER THE GRAND STAIRCASE ON THE FIRST FLOOR. LATER HE HAD TO MOVE HER OUT OF THE HOUSE BECAUSE OF STATE LAWS. MRS. SKEEN WAS MOVED TO A PLOT AT THE BOTTOM OF THE HILL NEAR THE ENTRANCE TO THE PROPERTY. I DO BELIEVE THAT THE RESTAURANT NEVER TOOK OFF BECAUSE OF THE LOCATION ! IT'S FRUSTRATING FINDING YOUR WAY TO THE MANOR. AS YOU DRIVE BETWEEN TWO OLD BUILDINGS IN THE POOREST PART ON TOWN, YOU WILL FIND THE WINDING ROAD THAT LEADS TO THE STRUCTURE. Skene Manor is open for lunch and tours. Attached is the actual web site. I was very happy to see Skene Manor included in your castles website. While it may not be a castle in the true sense of the word, it has always been described as the castle on the mountain and is very impressive. However, your history is way way off. Skene Manor was built in the mid-1860s by a Judge Potter of the NY State Supreme Court as his personal residence. It was named Potter's Terrace at the time and that "address" still stands in the official mailings. It is built of native stone blocks and overlooks the harbor and village of Whitehall, NY. Philip Skene, who lived during the American Revolution and was the founder of Whitehall .... which he called Skenesborough ..., needless to say never lived in the castle as it was built nearly 100 years after his death. He might have lived on the mountain in the vicinity but no one knows for sure. The legend of Mrs. Skene's ghost goes back to the true story that she was the wealthy one in the Skene Family and Philip, her husband, would received an annuity as long as she "remains above ground" --- When she died before Philip, he did not want to lose his money so he put her in (what was said to be) a lead coffin and propped her up in a corner of the basement. The story of the unburied Mrs. SKene and the ghosts of Skene Manor became intertwined and when the 20th century owners opened a restaurant and bar in the establishment (a 5 star restaurant at the time) they made "the" coffin (I don't think it was "the" coffin) a cornerstone of the bar and had a plastic hand sticking out. Many a heavy drinker "saw" Mrs. Skene in the halls of the castle in those days. Over the years it has been owned by many different parties and was a restaurant during most of those transactions. However, about 15 years ago the owners, who eventually lost it to taxes, let it fall into heavy disrepair and when they left town (in the middle of the night evading animal cruety charges) they striped the castle of chandeliers, doorknobs, etc. It was nearly sold to a party in Vermont who was going to dismantle it block by stone block and move it to his state. At the last minute a group called SOS (Save Our Skene) was able to raise the money to pay the back taxes and for the past 6 or 7 years have been working to "rebuilt" the beauty that was once Skene Manor. It is once again open (except in the months of January/Feburary/March) on Friday, Saturday, and Sunday from noon to 4. They have guided tours (free) and a tearoom where homemade soups and sandwiches and desserts are served at a modest price. There is also a nice gift shop in the former bar area. No ... the coffin is not there anymore. The animal cruelty people probably took that too. The Christmas decorations are always gorgeous ... Victorian in character and a tree in each of the restored rooms. The bottom floor is completely restored (except for some work on the wall coverings in the hallway) and most of the second floor is well underway. The great clock in the bell tower has not worked since its innards were donated to the war effort in the 1940s. It is hoped that one day it too will run again. In my opinion, after seeing a closer photo of Skene Manor it is not what I think of as a castle. It has a wonderful tower, but no crenelations, or drawbridge, etc. I will leave this on the webpage for a while, but will probably remove it someday. A special thanks to Earl Thibadeau for sending in the second and third photos.